Cadmium is known for its toxicity in animals and man as it is not used in these species. Its only role in biology is as a zinc replacement at the catalytic site of a particular class of carbonic anhydrases in some marine diatoms. The toxicity of cadmium continues to be a significant public health concern as cadmium enters the food chain and it is taken up by tobacco smokers. The biochemical basis for its toxicity has been the objective of research for over 50 years. Cadmium damages the kidneys, the lungs upon inhalation, and interferes with bone metabolism. Evidence is accumulating that it affects the cardiovascular system. Cadmium is classified as a human carcinogen. It generates oxidative stress. This chapter discusses the chemistry and biochemistry of cadmium(II) ions, the only important state of cadmium in biology. This background is needed to interpret the countless effects of cadmium in laboratory experiments with cultured cells or with animals with regard to their significance for human health. Evaluation of the risks of cadmium exposure and the risk factors that affect cadmium’s biological effects in tissues is an on-going process. It appears that the more we learn about the biochemistry of cadmium and the more sensitive assays we develop for determining exposure, the lower we need to set the upper limits for exposure to protect those at risk. 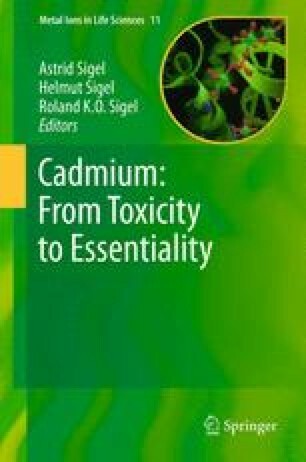 But proper control of cadmium’s presence and interactions with living species and the environment still needs to be based on improved knowledge about the mechanisms of cadmium toxicity; the gaps in our knowledge in this area are discussed herein.